Non-conventional weaponry. The use of handcrafted weapons to confront the security forces seeks to create a blurred line between peaceful protest and tactics of subversion and urban warfare, so that the deaths will occur and then be endorsed to the government as part of a “human rights violation” case. Metras, mortars, rockets, among other implements, are used by mercenary collision groups in Venezuela and caused damage to Adrián Duque, Armando Cañizalez, César Pereira, Diego Arellano, Miguel Castillo, Roberto Durán and Yeison Mora, who were killed by metal spheres or by civilians from the same side of the demonstrations. Andrés Uzcátegui, Nelson Arévalo Avendaño, Neomar Lander and Engelberth Duque Chacón were also killed handling handcrafted explosives. 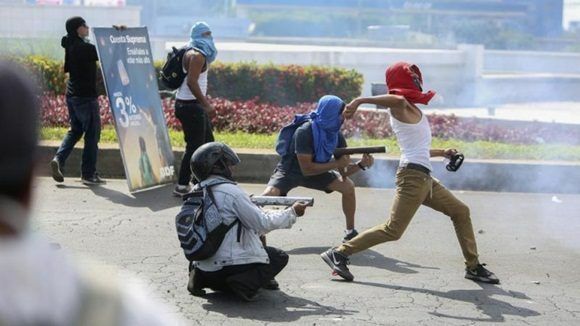 During the violent protests in Nicaragua, armed groups taking the vanguard use similar devices. In order to avoid confusion because of the similarity of the images, the first photo corresponds to Venezuela and the second to Nicaragua. Rumor campaigns. Unconfirmed information is generated by psychological warfare operators who use social networks as amplifiers to create anxiety and panic in the population. Amidst the protests in Venezuela last year, some opposition leaders led a rumour campaign to link the Venezuelan government to the alleged use of chemical weapons, with the aim of attracting international media attention and generating terror in public opinion. At that time, on the other side of the Atlantic, the Syrian government was accused of carrying out a chemical attack, and it was later confirmed that the alleged attack was a setup to justify a US bombing campaign on the Arab country.Walter Lippmann This is a translatlion from Cubadebate of the Chavista-Venezuelan MISSION VERDAD commentary on the similarities betwee the recent Nicaraguan protests and the violent protests in Venezuela last year. The photos are from Venezuela last year, 2017. 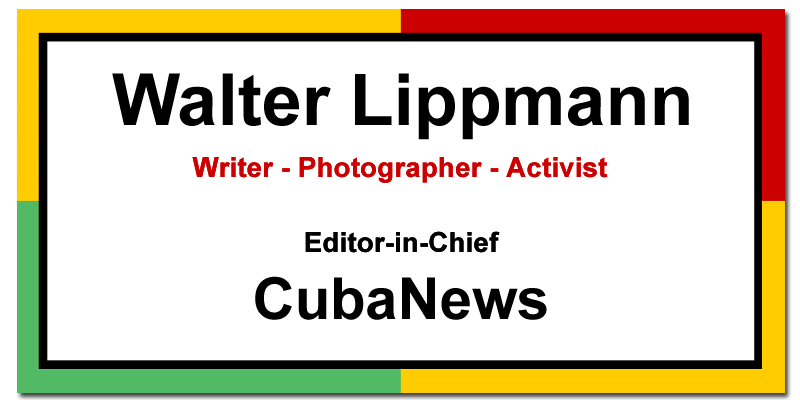 [link to many Twitter images of Venezuela in 2017, wl] https://twitter.com/dsmolansky/status/850804443557888000Walter Lippmann This is a translatlion from Cubadebate of the Chavista-Venezuelan MISSION VERDAD commentary on the similarities betwee the recent Nicaraguan protests and the violent protests in Venezuela last year. Trying to emulate that same sense of opportunity, in Nicaragua the use of rumor was used to link the government to the use of chemical weapons, a lie that, although it fell, was useful to the oxygenation of violence via social networks. Manipulation of death figures. Those killed during the violent events are reported without any explanation or specification, so, as in Venezuela, the media blames the government or “armed groups”. With this tactic in the use of means, a dossier is drawn up that could allow for intervention or coup d’état, depending on the circumstances. Media such as ABC have launched a death toll that even the local media cannot confirm. As we have seen in the previous ‘coincidence’, these estimates have been put into practice by operators with long experience in the information war against Venezuela. In Nicaragua, the international media is chorus of ghostly “reports” that place the death toll at over 20, unable to say whether they are confirmed or not. Applying the same disinformative maneuver, it attempted to hide the fact that in 2017, for example, 25 people died in Venezuela who were passing through the vicinity of a demonstration but were not directly involved. Cases such as those of Almelina Carrilo (Caracas) or Paola Ramírez (Táchira), murders committed by opposition demonstrators, were used as media triggers to escalate the violence by holding the government accountable without any judicial resolution of the cases. Looting and damage to public and private property. Armed groups in Nicaragua have looted several premises of electrical appliances and even motorcycles in some parts of Nicaragua, and have caused damage to state facilities, such as hospitals and educational institutions. The profile of violence has been professional and focused not only on key service infrastructures for the daily life of the population, but also on symbols and institutions of state power. Chavista-funded clash groups set fire to and attacked public buildings such as the Executive Directorate of the Judiciary of the Supreme Court of Justice. This is just one small example of the burning of public transport units, libraries and hospitals during 2017. Use of snipers. In Venezuela, targeted killings were carried out using snipers, and Sergeant Niumar Sanclemente (Miranda) and Carabobo Police officer Jorge Escandón were killed with accurate shots. Jesús Leonardo Sulbarán and Luis Alberto Márquez, workers in the governorate of Mérida, were also shot from several buildings in the state. The journalist Angel Gahona, from a state television channel, was murdered on Saturday night while he was broadcasting the events on Facebook Live in Bluefields, Nicaragua. He was walking behind the police forces and a gunshot shot him in the head in front of dozens of people. From April 11, 2001, through the Euromaidan to Nicaragua, snipers have been a recurrent resource in coup operations conducted from the US. Use of show business influencers. To implement the sensitivity of people linked to the entertainment industry is a successful advertising resource to reach support for the days of violence in increasingly broad strata of public opinion. This catalyst is still useful for this type of operation; in the case of Venezuela, there were too many show business figures demonstrating their bias against Chavism. In Nicaragua this resource has also been applied through international musical references, Miss Nicaragua 2018 Adriana Paniagua and other characters from the local entertainment industry. Symbols and glorification of death. The lists of dead people painted with chalk on the pavement used in Nicaragua are similar to those written in Venezuela during the 2017 guarimbas, with the purpose of hiding the causes of each case and transferring the human scars of the violence to the government. Even though among the deceased, in both Venezuela and Nicaragua, there are members of the security forces, students, workers and political activists, it is important for the media deployment to swell false lists and give it a “non-violent struggle” aesthetic, which, being internationally recognized, empties these deaths of any local meaning by transforming them into consumer products.